Snowy Moose Creations: Nice surprise today, and paying it forward! I had a rough day at work today...there are a lot of changes going on in the school district I work for and one of those changes involved me moving from the school I was at to the one next door. I dont like change, even after all those years of being a military wife! I like my routine and when it gets switched up I get very anxious and just need to work through it. Hence what I've got going on right now! So because of my foul mood I was just sitting on the couch, watching the only daytime TV I can stand(the show The Talk, I love it! Sharon Osbourne and Leah Remini are hysterical) when the little noise on my cell phone goes off telling me I have email. 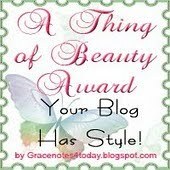 I figured it was probably junk but to my surprise I had a nice comment from Michele, of Michele Hearts Paper, giving me a little blog award. Its the first one I've ever gotten and for such a cool person to consider me worthy just made my day! Now, as part of it I have to share with 5 bloggers that I think deserve the award, and also share 5 things about myself, so here goes! 1. I love love love moose. I know, you are probably shocked about that and would have never guessed ;) but yes, its true! One of my favorite things about living in Alaska is looking out my window and seeing a big old moose in my yard! 2. I grew up in Massachusetts and Colorado. Lived in MA until I was 12 and then because of my dads job we had to transfer to CO. I hate CO. MA will always have a part of my heart, I am a New Englander through and through, no matter where I spend the rest of my life. 3. Thanks to my time in the Navy and for marrying my husband 4 yrs into his 20-yr Navy career I've also lived in FL, IL, Northern CA, Southern CA, CT and WA. Out of all those CT and WA were my favorites. 5.I love heavy metal and hard rock. So know you probably know more about me than you wanted too, hehehehe. I'll just go ahead and share with you 5 crafty ladies that just totally rock! Holly over at Holly Beary Designs---I've known Holly for many yrs now, we used to live right behind each other before the military separated us! Sometimes she is just too damn creative and I want to smack her, LOL. Karen of Stamping In The Boonies--I met Karen through Holly, and I can definitely see where Holly gets her talent from. I love Karens style! Candy over at Stampin With Candy--I recently discovered Candy through a Christmas challenge blog we both frequent and what a talented lady she is! Last, but certainly not least, Jayme of Closet Stampin', Its Not A Hidden Addiction!--Jayme and her family just transferred to Alaska and she loves it already, which is just awesome. Unfortunately she is close to 300 miles north of me :( If I remember correctly Jayme is the one who told me about the previously mentioned Christmas blog when I met her through the Friday Mashup. I might have that mixed up though because my memory stinks! LOL Anyway, she is another super talented gal whose blog I love to check out! And go check out Michele, the great crafter who got this blog post in motion by mentioning me on her blog! In one of the Friday Mashup challenges she used a bear image to represent summer and TOTALLY won me over for life with it! Thanks so much, Lisa!! I was having a terrible day too then saw this!! Totally brightened my day! !